Leg drive creates dominant tackles where the tackler lands on top of the ball carrier. This lets the tackler pop to his feet and either contest the ball or rejoin the defensive line. Dominant tackles slow the ball giving the defense valuable seconds to realign. Watch the first clip for examples of dominant tackles created by leg drive. Argentina is known for being abrasive in the contact area. Consistent leg drive in contact contributes to this well deserved reputation. In the 3rd section of the previous clip France have Argentina on the back foot after a well worked set piece move followed by quick ball. Argentina is forced to make several rescue tackles and looks to be in trouble. But strong leg drive by the second tackler gives Argentina’s defense time to recover. The object of 7s defense is not only to stop the ball carrier but to also win back the ball. In the following clip, the tacklers’ strong leg drive creates breakdown penalties against offensive support players. Defensive players flood the tackle area with forward momentum before the offensive support players can enter, generating side entry penalties. Leg drive is also an effective habit on offense. Just as leg drive by the tackler creates slow ball and penalties against the defense, leg drive by the ball carrier produces quick ball for the offense. Quick ball is played before the defense can realign. As the following clip demonstrates, leg drive by the ball carrier generates defensive penalties and scoring opportunities. 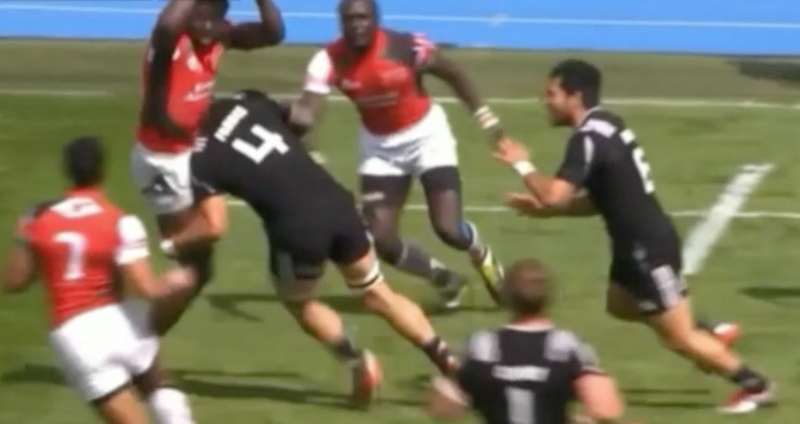 Leg drive’s importance in rugby 15s — where contact is frequent — is well understood. Powerful leg drive establishes control at the gain line, and the team that controls the gain line controls the match. But leg drive is also important — and perhaps even more important — in 7s. On the 7s pitch time is compressed. Leg drive by the ball carrier buys valuable seconds for support to arrive and continue the attack. Leg drive by the tackler generates penalties, turnovers, and time for the defense to realign.